The Hollywood commission continues to make a mockery of itself when it comes to addressing the city’s entrenched symbols of slavery. Hollywood, Florida, has the infamous distinction of having various streets named in honor of individuals who took up arms to perpetuate slavery by fighting for the confederacy. Three streets targeted are Forrest, Hood, and Lee. We call for ending official support for symbols of slavery, stop delaying, and take down these symbols from our communities today! They pay tribute to systemic racism that cannot be tolerated. 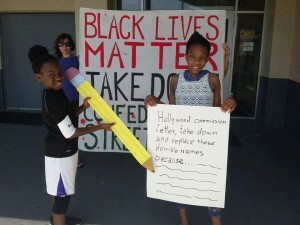 Given the plague of problems we continue to face today with the proverbial evil of the nation, the color line, we call on the people of Hollywood and South Florida to join us at the city commission and demand these ludicrous names be replaced. There shouldn’t be room for paying tributes to slavery, racism, and its symbols in our communities. We should know and understand our history but honor those who fought against hate, not those who perpetrated it. That these names need to be changed is obvious, that it’s absolutely ridiculous it hasn’t happened can’t be more clear, yet it continues to be delayed. But with strong involvement from the community it will happen. Get there BEFORE 5pm to be placed on “comments list” and be able to speak in support, OR just drop by and show support.